As we’ve said before, chatbot virtual assistants natural language processing is the next big thing in social media messaging platforms. This simple and effective artificial intelligence uses natural organic language to machine learn conversations with customers. It is not only low-cost, but extremely customizable and effective. If your brand isn’t adding resources into generating your own chatbot for customer support, it’s most likely because you don’t think your business and customers have a use for it. It is time to rethink your approach because you can use chatbots in countless creative ways to boost sales, enhance customer service, and engage with customers and generate brand awareness. 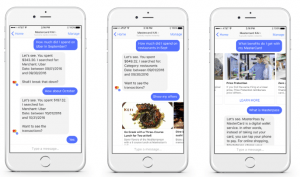 So how are the big brands leveraging chatbots? 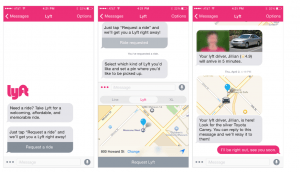 People are less keen to download new apps to their phone than ever before, and Lyft is quick to offer a solution. The transportation company now allows customers to request a ride through Facebook Messenger, Slack and Amazon Echo. Not only will the bot supply you with the current location of your driver via map, but also sends a picture of the license plate and car model. Now your friend can send you their location and you can request a car there and track it without leaving one app. Foodies, this one is for you! The health store provides users with recipes through just a few keywords. 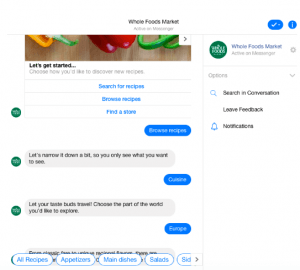 Simply provide a type of cuisine (Italian, Asian, Greek, etc), type of meal (appetizer, main dish, salad, etc) and the bot will start asking specific questions to help narrow down the type of recipe you’re looking for. It also registers emojis – allowing you to simply send over a pizza emoji to find the tastiest way to cook up a cheesy slice! 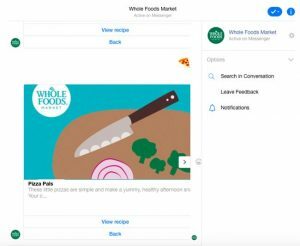 Whole Foods is pretty genius to generate this feature – it sends constant traffic directly back to their website. 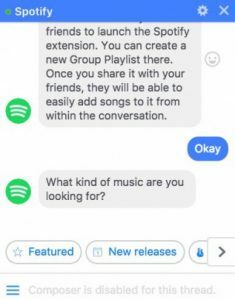 Spotify’s Facebook Messenger chatbot is packed-full of features anyone would love to try. Users can not only search for their favorite songs and artists but can also create a new playlist in just seconds after answering a few questions about musical preferences. The chatbot will then curate a playlist according to activities, interests, preferred genres or even a mood! Taking it one step further, the chatbot allows you to send 30-second audio clips of your favorite songs to family and friends who can listen to it directly in the Facebook Messenger app whether they are a Spotify customer or not. Believe it or not, brands are also managing to educate people through their chatbots! General Electric debuted an incredibly cool feature on World Emoji Day that supplies users with scientific facts in the form of emojis! For example, the chatbot sends over the envelope emoji and “1971” for clues as to what year the e-mail was invented. Users enjoy guessing the answer and requesting additional points. Fun and an easy to learn! Chatbots are a great advertising tool, too, and Starbucks is here to prove it. 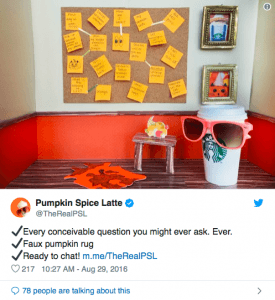 The coffee-chain created a chatbot just for its famous Pumpkin Spiced Latte called “The Real PSL”. They promoted the seasonal drink by setting up the bot to give witty answers and jokes about fall. Though this doesn’t win any customer service points, they do deserve credit for thinking outside of the box, and everyone loves a good pun, right? Gone are the days where you have to browse aisles of book stores for a cover to catch your eye. 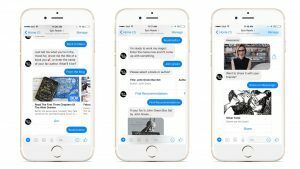 Harper Collins’ Facebook Messenger chatbot will do that for you in just seconds! The bot will ask users a few simple questions such as preferred genres, favorite authors or favorite titles and sends over a book that matches the indicated tastes. Simply copy and paste that book title into Amazon, hit order and it will be in your hands in just days. It’s tough living in 2019, isn’t it? This company’s goal is to make healthcare knowledge accessible by everyone at any time – and they’re doing a phenomenal job achieving that goal so far! 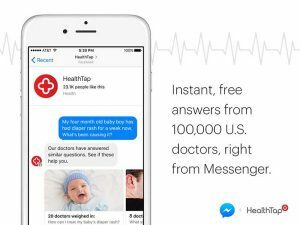 Their Facebook Messenger chatbot allows you to send in a general health question or symptoms and it will automatically send back similar questions that their doctors have answered. If you don’t find an answer, it will connect you with a physician who will respond within 24 hours. This is remarkable – and perhaps the future of healthcare? Ever walk all the way to your favorite theme-park ride only to find there is a 3-hour wait? Not anymore (at Universal Studios, at least). Now you can simply hop on Facebook Messenger (no need to download another app!) and ask how long the wait is for a specific ride or a complete list to browse all of your options. The chatbot’s features don’t stop there, either. It will guide you to the nearest restroom or restaurant, help you make a reservation for later and supply you with up-to-date park hours. Users looking to stick to a strict budget in 2019 will love this chatbot! It seamlessly eliminates the need to go back and comb through your purchases each month. You can ask how much you spent on Starbucks in January, how much you spent on Ubers and even look up a specific transaction. Additionally, the app also allows customers to order food from select locations using their Facebook Messenger chatbot.